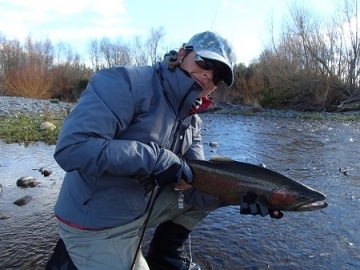 Another week has passed and many anglers have again tried their luck on our rivers here in Taupo, most with good results. Fishing was noticeably slower this week but for those who tried hard and changed things about the fish were there in good numbers. We had small pods of silver fish moving through but not in big numbers. Weather has been far from enjoyable with some fairly strong winds blowing from the south sorting out the men from the boys. I felt sorry for nymphers this week as I watched efforts just being blown back on themselves, may have been a good week to go to the dark side and use the wet line. Fishing pressure certainly was not as busy this week with the lower river being empty at times. The weather may have had something to do with this but also the decrease of the amount of trout running. While the Tongariro was quieter the Hine was again in full swing with every car park full with cars and anglers rushing in all directions. Holly Moley there’sÂ a few fish in the middle reaches of this river but conditions are the lowest I have seen it and fish are very spooky after they have been fished at for the day. Summer methods are needed, two small bead heads and tiny little indicator has been doing the business- you could even go to a big dry for a strike indicator followed with a light nymph. 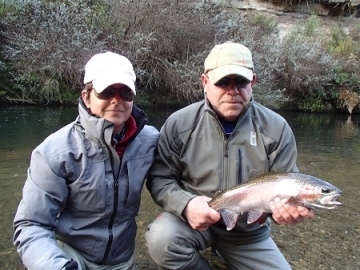 Fish this in the fast water for best results. 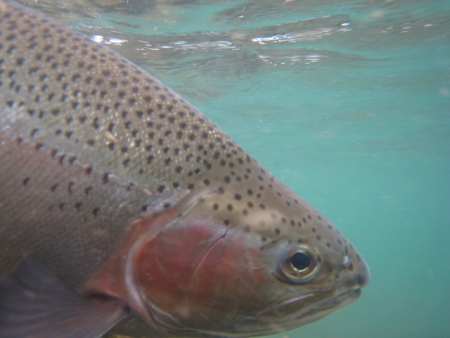 I fished here for a day and a half this week with good results but all the best trout have come from fast water not the deeper calm water which holds numbers in the winter. Care must be taken in here while targeting trout, try and leave those in full swing of spawning and keep out of the river avoiding the reeds. Great sport is available here especially for those not looking for fish to eat or kill, lots of dark fish in full spawning colours. I have had no reports from the Waitahanui or the TT but I expect they will be sneaking through just the same as they are in other rivers. I think our biggest problem through the Taupo systems is the lack of rain. All rivers are filthy with slime and it needs washing out to the lake, slime making wading interesting at times. This week I hadÂ a client loose his polaroids, drown his phone and break his rod, costly day out so please take care, lol. Wishing for full on floods at this time of year is a double edged sword. A huge flood will kill all the seasons eggs effecting the years to come and also wash all nymph life to theÂ lake killing our summer dry fly dreams…….but the rivers do need a wash.
Harling on the lake should start to pick up with water temps slowly rising and the days starting to become longer. I quite enjoy summer nights trolling the fly line behind the boat while sipping on a soda. IÂ generally stretch all the fly line outÂ and about twenty metres of backing and just have the motor ticking along. Smelt patterns all work but the old Rabbit seems to do the damage for me, the movement must be great in those tails enticing aÂ strike from rainbows.